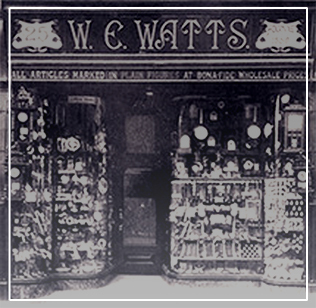 Watts1858 is a family owned business established in 1858. Our luxurious and relaxed showroom based in the heart of Derby's Cathedral Quarter, is with the help of our friendly and knowledgeable team, the perfect place to find that precious gem. We stock a large range of competitively priced diamond rings and as an official stockist of brands such as, Omega, TAG Heuer, Bremont, Mont Blanc, Longines, Tissot, Mondaine, you can buy confidently with the knowledge of having the utmost in after care and service. The buying, selling and part exchange of watches and jewellery is also a speciality of the business. Mont Blanc pens and leather, Georg Jensen jewellery, Fope, Kreiger and Ti Sento are also exclusive to Watts1858 in the Derby area. Also available alongside our extensive 18ct gold, diamond and platinum jewellery lines is a range of locally produced Blue John jewellery. I spoke with Glyn in Watts 1858 who kindly extended the return period (just in case!) beyond 14 days, to accommodate an early order for a surprise Christmas present. I was mailed promptly to confirm this in writing, and having placed the order, Glyn mailed again later to advise that the watch had been dispatched and I should receive it next day. Which I did.